Here you have the best waterproof winter jackets for women for 2018 – 2019 winter season, all top-notch items from reliable brands, with either synthetic or down insulation. Women’s insulated down jackets. The meaning should be obvious, the insulation is down and the external layer is waterproof. 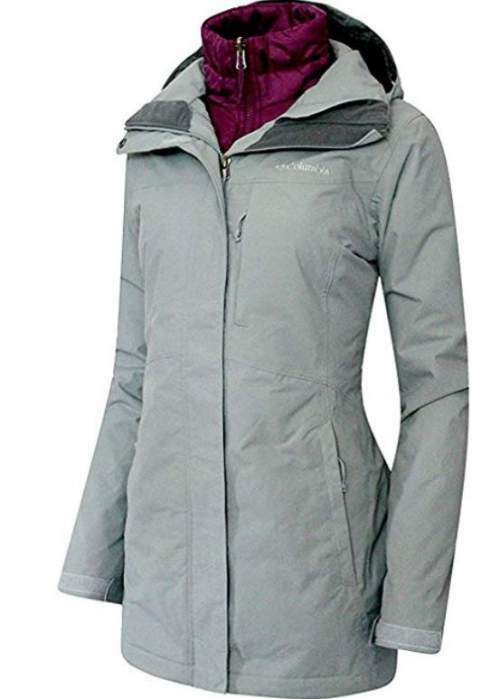 Women’s synthetic insulated jackets with an external waterproof layer. You will see an example where the down and synthetic insulations are combined. Some of the jackets are with a removable insulation layer, either synthetic or down. Most of the jackets are long models. This is normal to have if you need a really warm jacket that is supposed to protect most of your body. So most of them are for casual use. It is particularly important to have a waterproof jacket if the insulation is down, although nowadays down is normally treated so it may perform well even in damp conditions. Drying a wet down may take time, so it is better to have a waterproof and at the same time breathable shell layer for protection. 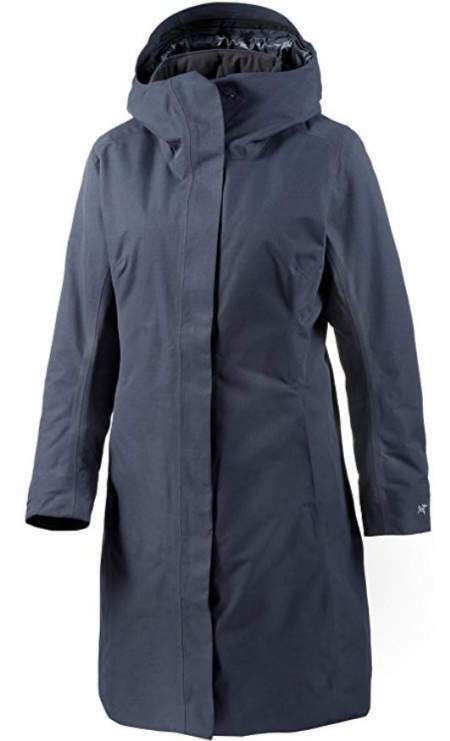 Arc’teryx Patera Parka is in the category of long knee-length casual jackets and with the weight of 2 lb 3 oz (1 kg) it is still lighter than the North Face Arctic Parka II shown below. The back length is 36.75 inches (93 cm). The insulation here is a high-quality 750-fill European goose down combined with a CoreLoft synthetic insulation at places that first get wet, i.e., at the hem, collar and sleeves. The external shell is a durable and breathable fabric 75D with a waterproof Gore-Tex membrane. This is a 2-layer construction built from 87% polyester and 13% cotton and with a durable water repellent (DWR) finish. The jacket is with a low-profile insulated hood that also includes a laminated brim. You have drawcords for adjustability and to prevent cold drafts. Underarms are a no-lift gusseted construction which provides a wide range of movement. On the front you have a 2-way full-length zipper with a storm flap and with snap closures. You also have an internal draft collar that seals in heat, and internal wrist cuffs which add protection against cold. There are two hand pockets and one internal zippered pocket. 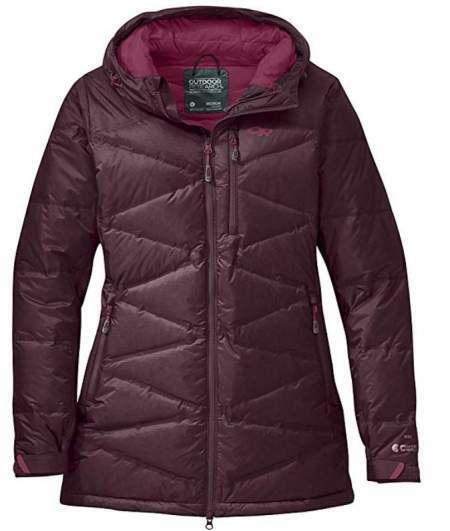 Columbia Women’s Frigid Flight Long Interchange 3 in 1 Jacket. This Frigid Flight jacket is one of the long models as you realize from its name and from the picture, and this is also a 3-in-1 type with a removable inner insulation layer. This is a jacket for casual use. The external jacket is a coat which you can wear separately at mild temperatures, but you can use it together with the inner jacket zipped into it or just as an extra layer. This is a nylon shell with Columbia’s Omni-Tech waterproof and breathable fabric and with sealed seams. The shell jacket is with a detachable hood and three external zippered pockets, plus an inner zippered pocket. The front zipper is with a storm flap and under the chin you have a pleasant fleece addition which you can see in the picture above. The cuffs are with Velcro tabs so you can cinch them as you wish and use also over your gloves. The hem is with an adjustable draw-cord. A few words about the insulation jacket. This is a quilted polyester shell and polyester lining with Columbia’s Omni-Heat thermal reflective technology. If you are not familiar, this implies shiny dots that thermally reflect your own heat back towards you. This jacket can be used as a stand-alone everyday jacket. It comes with two external pockets, a full zipper front, and a very pleasant and high collar. Note that they have at least four different color combinations. This jacket has been on the market for a number of years already and all is known about it. This is a classic design but with all modern features against cold weather. The jacket is waterproof and breathable, and very warm. The shell jacket is a durable polyamide with a PU membrane, waterproof and very soft, and the liner is polyamide and polyester. In between, you have a lofty Supreme Microloft synthetic insulation. So this is a jacket without a removable insulation layer. The hood is adjustable, insulated, and fleece-lined, with a removable synthetic fur edging which you see in the picture. You also have a drawcord adjustability at the waist and hem. On the cuffs you have Velcro closures. The jacket is available in 5 different colors. I see it best used as a casual jacket, but it is also good enough for hiking. 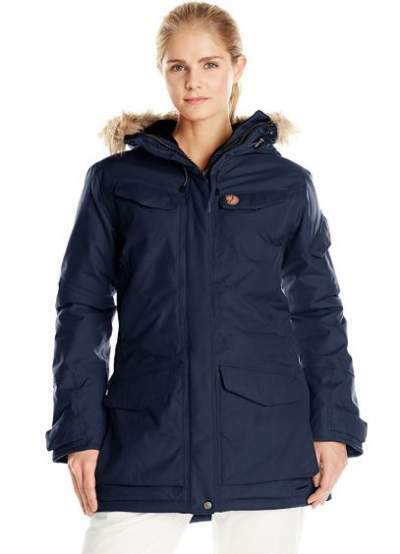 This OR Floodlight Down parka is fully waterproof and insulated. The shell material is a 2-layer Pertex Shield, 100% nylon 30D ripstop, a breathable material. What you see in the picture above as baffles is not made by stitching, they are in fact welded. But the parts of the jacket are indeed stitched together, like arms and the jacket’s body, but here all stitching zones are taped for a full protection. The insulation is not removable and you have a premium 650 Fill Power Goose Down. Although this is a long parka, it weighs only around 20 ounces (567 g), so it is still very lightweight. This is also a technical piece, so the hood is helmet compatible, insulated, fully adjustable, and equipped with a wire-brim. Also, the front zipper is two-way type so you can open it from any side, and this is suitable because of the length of the jacket. Note that you have the best quality YKK AquaGuard Vislon zippers. Behind the zipper you have an internal storm flap. The cuffs are with Velcro tabs and this convenient when you use gloves, so you can put the cuffs over them and cinch down. Regarding the pockets, you have 5 in total, two hand pockets with zippers, one chest zippered pocket, and inside you have two shove-it pockets. The fit is standard and the jacket is very comfortable because of its Dynamic Reach underarm panels. The average length is 30 inches (76 cm). The North Face Arctic Parka II. This Arctic Parka II is insulated with 550-fill-goose down and the external layer is waterproof due to its DryVent membrane. This is a 2L waterproof, windproof and breathable highly durable shell. The external surface is with a durable water repellent finish. The hood is removable (you have a zipper) and it has a fashionable faux fur ruff and a moderate down insulation as well. The fur does a good job at trapping warm air in. Note that the jacket weighs 2.8 pounds (1.27 kg) so this sounds a lot, but my daughter has it and I can tell you that you do not have such a feeling when you have the jacket in hands. More or less the jacket is good for temperatures at freezing, for lower temperatures you might feel cold. The hand pockets are lined with microfleece but not well insulated. You also have one interior media pocket with a zipper. The main zipper is a two-way type so you can open it from both ends. The sleeves are with nylon cuffs at the wrist, this is a great feature to prevent cold drafts. All in all, this is a stylish jacket, very functional, fully reliable and a great value for the money. 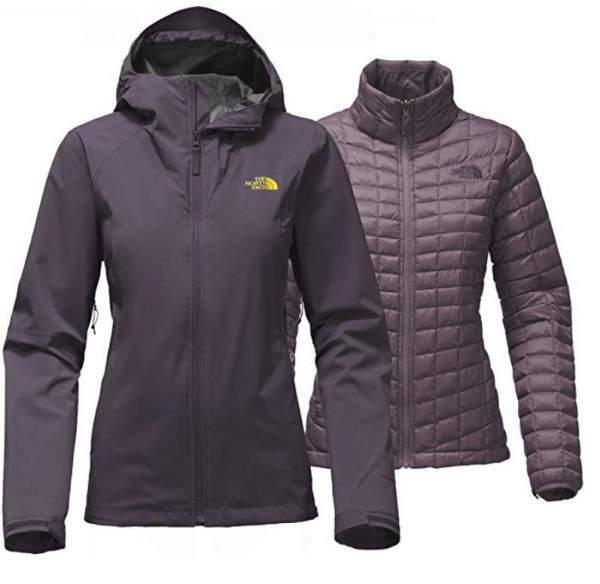 The North Face Women’s ThermoBall Triclimate Jacket. This is again one of the interchange jackets or 3-in-1 jackets. The picture above shows the external shell jacket and the inner jacket when it is unzipped from the shell. One detail which you might want to know about this jacket is that it is available it some 20 or so different colors. The outer jacket is a 2.5L hard shell, waterproof and breathable, with seams fully sealed, and with the stretch DryVent membrane. This jacket is a blend of polyester and elastane and it is with a durable water-repellent finish. This same DryVent system is used in several rain shell jackets from this brand, it has been lab- and field-tested to ensure the best possible function. The waterproof rating is 25 PSI minimum after 20 launderings, and the breathability is 750 – 800 g/m²/24 hours average. As for the inner jacket, this is a 30D nylon shell with a warm and compressible PrimaLoft ThermoBall synthetic insulation. This insulation is similar to down while offering better all-weather performance. It is lightweight and compressible and it contains small PrimaLoft synthetic-fiber clusters that trap the heat within small air pockets to retain warmth. They claim that they have independent testing by Kansas State University showing that it is equivalent to 600-fill goose down. The jacket is with an integrated adjustable hood and the shell is with pit zip vents. This fit is standard, the average weight is 730 g (25.75 oz), and the center back length for the outer shell is 27 inches (69 cm) and 24.75 inches (63 cm) for the inner. It retains loft over time. It has a high warmth to weight ratio. It loses warmth and insulation when wet. This is why it is treated. It is more expensive than synthetic. 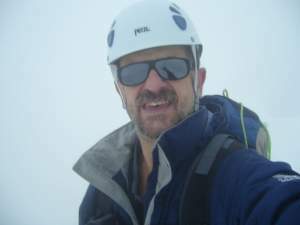 It is best to use down insulated jackets in cold and dry conditions, and for non-aerobic activities. But what about synthetic insulation? It retains warmth when wet. It is less expensive than down. Heavier and bulkier than down. It lasts shorter than down. In general, if you are not sure about weather conditions during your outdoor activities, use synthetic. It is also better than down for aerobic activities. If you go for a down jacket, the fill power is the first parameter you will see. So if you are not familiar with the terminology, the numbers 550, 600, 700, 800, etc., denote the volume (in cubic inches) which one ounce (28 g) of down fills. So the bigger the number the better, this means a more lofty and lighter insulation. But this also implies a higher price. But this should not be mixed with fill weight. A jacket with 550 down fill can be as warm as a jacket with 800 down fill. This can be achieved simply by adding more down. This would make it heavier and bulkier of course. So when you are in the process of choosing, and if you have two similar models with the same type of the fill, go for the jacket which has more insulation in absolute terms (in grams) if you need a warmer jacket. Regarding both of these criteria, down is a clear winner. So if you are a backpacker or mountaineer and the weight is critical as well as the packed size of the jacket, the choice is easy, go for a down jacket. But the insulation is not the only factor that determines the weight and packability. You also have the length of the jacket for obvious reasons (more material) and the thickness of the fabric. This is why those technical jackets have a very low D value for the fabric, but those are usually less durable. A hood also adds to the weight, but this is an important element and it is definitely needed. Hoods in such jackets are insulated and adjustable, some have fur as well, so they add to the warmth of a jacket. Those in technical jackets are helmet-compatible and they can be large and bulky. Note that in some jackets the hoods are removable, you can have a zipper like in the case of The North Face Arctic Parka. Thank you for reading. 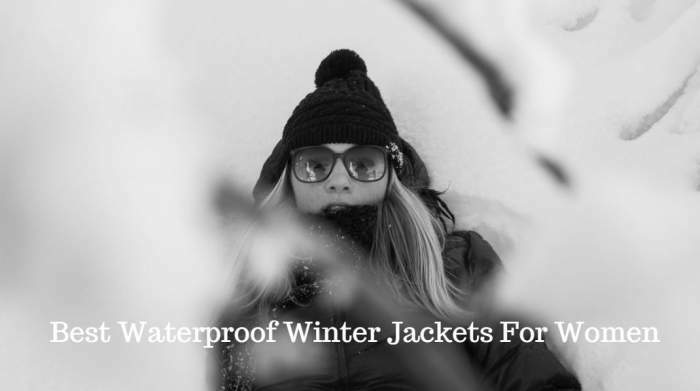 This list will be updated regularly as I find some good waterproof winter jackets for women on the market, so bookmark the post and visit it from time to time. 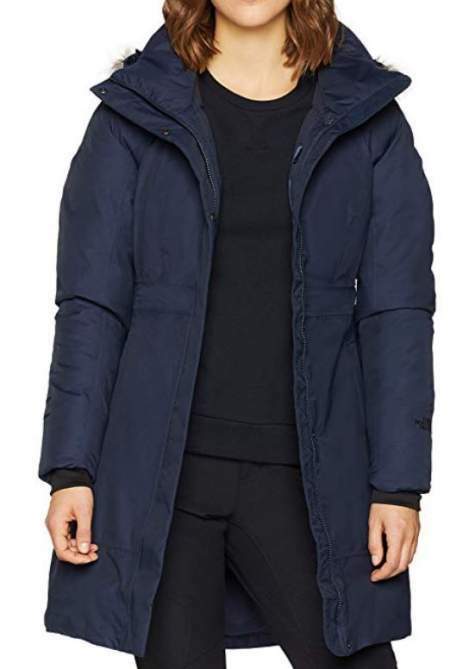 If you need an insulated but not necessarily a waterproof jacket, please check my list with synthetic insulated jackets and down insulated jackets for women. Want just a rain shell jacket? No problem, check this list with waterproof jackets for women. Please use the comment box below in the case of questions or comments. Is there some good jacket I missed? If so, please let me know.